There are no doubts that smartphones are experiencing an explosive growth, but somebody is getting the benefits more than others. The charts come from a Goldman Sachs report and were published at the FT. 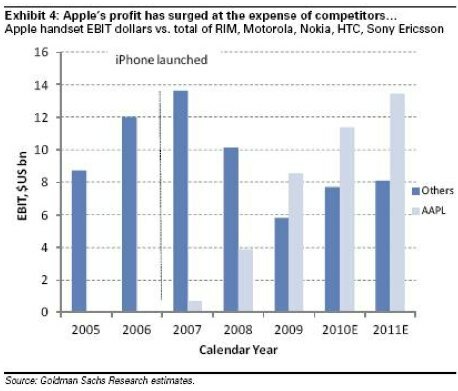 The first chart describes the profits of Apple compared to all the competitos COMBINED (EBIT earnings before interests and taxes). 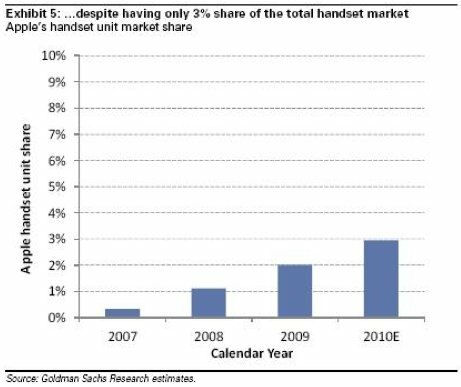 And the shocking part, as reported by Businessinsider is that Apple will generate 2X as much handset profit as the rest of the industry combined this year DESPITE SELLING ONLY 3% OF THE HANDSETS BY UNIT VOLUME. And apparently, Apple is maintaining its explosive earnings growth. As reported by Fortune in an article titled How Apple maintains explosive earnings growth, It’s now the second-largest company in the U.S., and it still manages to grow its earnings by more than 50% a year. In the four years I’ve followed Apple (AAPL) as it’s grown from a mere mid-sized tech stock to becoming the second largest corporation in the United States in terms of market capitalization, I never imagined that it or any other company of its size would be able to consistently grow its earnings by well over 50% a year. While Apple is now larger than Microsoft (MSFT), Google (GOOG), Cisco (CSCO), and Intel (INTC), it still enjoys the growth rate of small cap tech stocks. To get an idea of how deeply Apple continues to penetrate the market, Apple will likely produce 50% more in sales and 71% more in earnings in 2010 than it did last year. If this growth continues into 2011, Apple will surpass Exxon (XOM) to become the largest corporation in America. Not to mention that it already has more cash than any other company in the United States: $41 billion.